Membership sites offer something exclusive, something above and beyond what’s available to the mainstream. Membership sites teach things that can’t be learned from just searching for information on the web, and offer things that can’t be found with a free search. People are willing to pay for something good that isn’t available to just everyone. So membership sites are a great way to get paid for providing the world with excellent, specialized content, information and knowledge. But even if you have a fantastic idea for a membership site, you can’t just create it and rely on its fabulousness to keep current members and gain new ones. This is the issue at hand – membership sites are plagued by stagnating sign-ups. Often people sign up for a membership site only to leave the site a month or two later, so site owners are left scrambling to find new members to replace those that have wandered off. 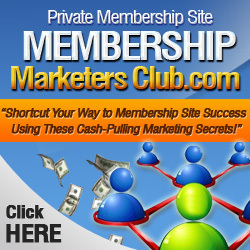 While you should never be discouraged from starting a good membership site, you do need to be aware of the inherent risks, and the answers to the question of how to get new members and retain them which will result in a growing site, and your growing income. We know that people are willing to pay for good online content, and it’s a hot way to generate revenue. The key is to provide continual excellent content that is completely exclusive. Depending upon the type of site, you can offer articles, reports, eBooks, software, forums, videos and even games to your paying members. The issue of losing members occurs when there either just isn’t enough new “stuff” offered on a regular basis to keep them interested, or they feel the membership fee is too high for the value they’re getting from the site. The problem of gathering new members occurs when there simply isn’t enough to entice them to join up. There has to be a really compelling reason to get out that credit card and cough up the initial membership fee to gain access to the exclusive treasures that wait inside the site. So here’s the bottom line: If you have a great idea for a membership site, go for it! But you have to commit yourself to creating a website that makes information and content available to your members that is truly above and beyond the things that they can find elsewhere, possibly for less money or for free. Keep your content fresh and be sure to offer something new and exciting on a regular basis – it has to make your members feel that they are getting their money’s worth and make them glad every time they pay that membership fee. When you’re working to attract new members, you have to make sure that the landing page(s) that you’re using to attract potential members gives them a very, good reason for signing up and giving you their money. You might want to offer a free taste of what they have to look forward to by signing up – discounts or free samples. Do what it takes to get them in the door, but be sure that once they’ve joined your membership site, you’re giving them what you promised – plenty of exclusive content that they can use!